Amateur Radio and the home of the Raby Mere Weather Station. Restoration project completed, MOT passed and on the road but where do we start…? Having acquired my late Grandfathers boxes of assorted motorcycle parts, 2 frames, 3 engines and a vast quantity of plastic bags to bursting I became convinced that a restoration project was a possibility. 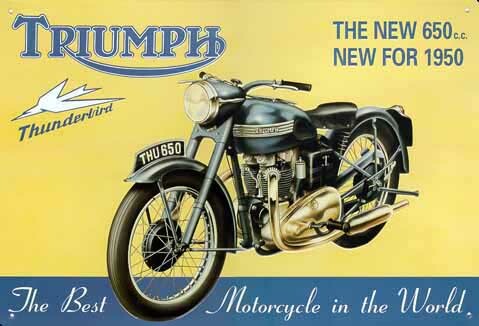 The discovery of a matching Triumph engine and frame was a great start with the euphoric find of the correct log book confirming it should all screw together to make a 1959 Triumph Thunderbird. Copies of the original workshop manuals were ordered and the research began… Over 3 years later having moved house and got married, the Thunderbird passed it’s first MOT in other 30 years. I’d be telling lies if I told you it was easy. I had to learn a great deal along the way, spend hours chasing down obscure parts, pattern parts and scouring Ebay. Most of the pattern pattern parts later being abandoned in favour of the more expensive genuine items or bent, filed and banged into shape to fit where the genuine part didn’t exist. Fingers were scuffed, cut, scraped and drilled also but it would be worth it in the end. One of my biggest regrets about the whole experience is that I didn’t take as many pictures to chronicle the restoration as perhaps I should have done. Many hours were spent on the project, often during winter evening and perhaps if I had occupied myself with taking rolls of pictures I wouldn’t be riding the machine today. I’ve selected some of the better snaps I did take and added them into this page with a little bit of information. It is not sadly a restoration guide, I stumbled around far too much and took too long to complete the task in hand, rather an insight and declaration of success even. I hope you enjoy it, and whatever similar interest brought you here as much as I did. Above is progress around September 2006. The engine is in the frame post strip and rebuild and you can just make out the new wiring harness in place. Rear suspension is complete as the swing arm had been assembled post painting. Nice new set of Hagon shocks complement a nice new rear wheel. Most of the rear items are in place now, including the ‘tin ware’ such as the chain guard. Moving forwards the front tank support bracket has gone on along with the fork assembly and lower halves of the nacelle. Moving on and a few months later the re-painted rear mudguard is now fitted, watch those spanners along with a pattern seat with white piping. The original rear number plate bracket was re-painted, decals applied and completed with a genuine Lucas rear / brake light assembly. 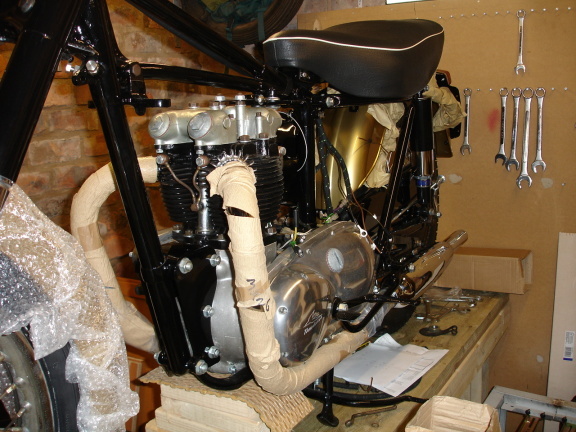 Also in the photo the pattern exhaust and silencers have been fitted. Keeping as much package as possible on items for as long as possible helped to avoid any inadvertent damage occurring. April 2007 and out into the spring rain. A nearly completed machine almost ready for the paper to be taken off the down pipes and fired up save for the fuel tank. From the start of the project I had kept aside now fewer than 3 fuel tanks of which I was sure 1 would be the correct fit. I was wrong. Ebay to the rescue and after some frantic bidding and a nervous wait for the postman a mechanically sound tank arrived which was the correct fit. With only a very slight dent and no obvious other issues it was off to the painters. September 2007. Note the new surroundings. A house move beckoned mid-project but here we are a few months into the new home and project complete. If memory serves me well, this picture was taken after passing it’s MOT test as a bit of a victory shot. Essentially complete here save for a few very minor details. February 2009. A lovely crisp, dry late winter going into spring day and perfect for a ride out. One of my favorite pictures taken just outside Thornton Hough on a quiet Sunday morning. A most excellent restoration project and I bet you enjoyed every minute of it too. I’d love t build a 1970’s Triumph flat-tracker one day but as the days just whizz by I know that time is running out and will probably never build one. However, I must remember to buy that lottery ticket and who knows………? not intersted in selling are you??? ?i could be interisted if so …. Wonderful job, I love the gold tin, is it original? I am doing the same to a 68 here in Canada, my 3rd Triumph. 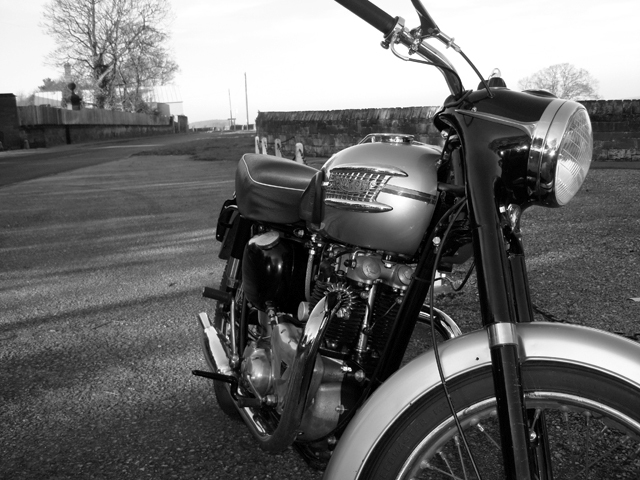 Old triumphs may not be as rare as some, but they are beautiful, usable, and doable as a rebuild. Thanks Bob. The gold colour is not from this model year, I believe it to be 1958. The 1959 model came in a rather dull grey colour. 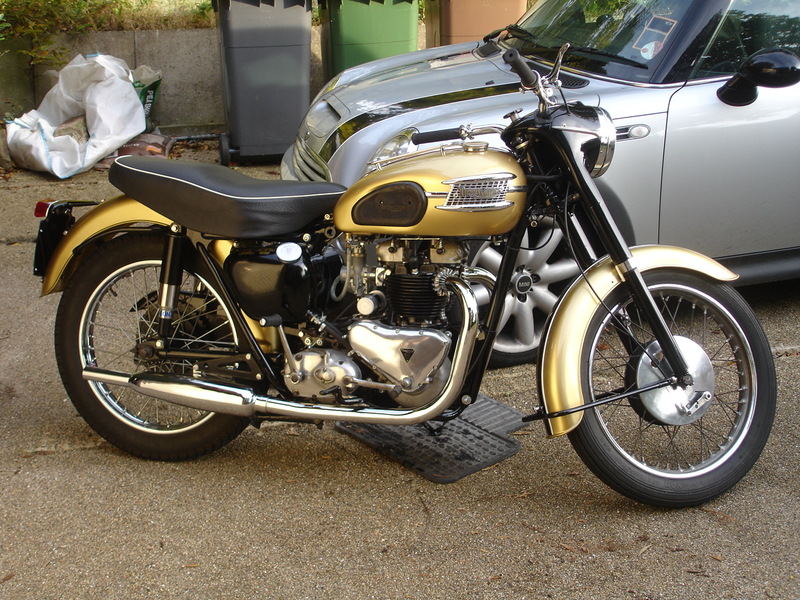 I saw the gold on a ’58 Thunderbird in a classics magazine and decided on it rather than the grey! !